​Arsenal returned to the top four of the Premier League after a hard-fought 2-0 win over Manchester United on Sunday evening. 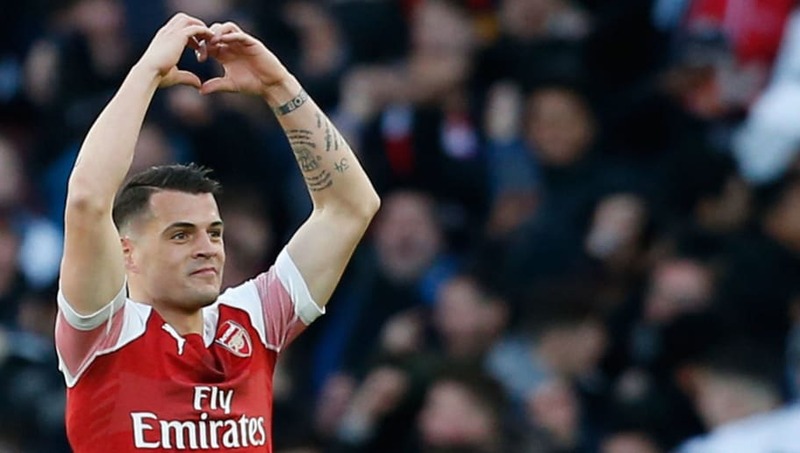 Arsenal started well and deservedly took the lead midway through the first half courtesy of a long range strike from Granit Xhaka which wrong-footed David de Gea in the Manchester United goal. United fought back in the second-half, but they were unable to break down a resolute Arsenal defence and were pegged back further when Pierre-Emerick Aubameyang converted a penalty with 20 minutes left on the clock. United continued to huff and puff, but they were forced to come away from the Emirates empty-handed. Check out the full breakdown of the clash below. It's been a debut season full of ups and downs for Unai Emery at ​Arsenal, but there is still a very realistic chance that the Gunners can finish in the top four - especially as both Tottenham and Chelsea are beginning to stutter in the league. Arsenal put aside their poor performance during their Europa League defeat to Rennes and did enough to warrant the three points in this one. They were organised defensively and repelled a Manchester United side which slowly grew into the game the longer it went on. It was by no means straightforward, but they were deserving winners at the end of the day. Their Europa League campaign is now under serious jeopardy, so finishing in the top four may be their only chance of making a return to the Champions League. If they can defend like this every week, then they will give themselves a decent chance at doing so. Starting XI: Leno (8*), Sokratis (7), Koscielny (7), Monreal (6); Maitland-Niles (6), Ramsey (7), Xhaka (7), Kolasinac (6), Ozil (6); Lacazette (6), Aubameyang (7). Substitutes: Iwobi (6), Suarez (6), Nketiah (N/A). STAR MAN - Bernd Leno hasn't always been totally convincing during his debut season in the Premier League, but he has looked increasingly solid between the sticks in recent weeks and was outstanding in this one. He produced a string of fine saves and dominated his box impressively - even making a few crucial interceptions with his feet to prevent United from getting in behind. His save from Romelu Lukaku at the end of the first half was also one of the most important moments of the match. That's fantastic from Leno. Keeping us in the game. After their incredible Champions League success over Paris Saint-Germain, morale at ​Manchester United appeared to be at an all-time high. However, they never really got going in this one and were unable to recreate the heroics of midweek. It was by no means a terrible performance - particularly as they were able to create a number of decent opportunities in front of goal - but lapses of concentration at the back from De Gea and Fred ended up costing them. Prior to Ole Gunnar Solskjaer's appointment, finishing in the top four was nothing but a dream. The Red Devils still have a decent shot at doing so, but this result will come as a big blow, especially as Arsenal were coming off the back of a poor performance in midweek. Starting XI: De Gea (5), Young (6), Lindelof (4), Smalling (5), Shaw (6); Matic (6), Fred (6), Pogba (6), Dalot (6); Lukaku (5), Rashford (5). Substitutes: Martial (5), Greenwood (5). STAR MAN - No one really stood out from a United perspective, but Diogo Dalot performed admirably out wide and was unfortunate to be substituted off midway through the second-half. The youngster has really stepped up to the plate after United were struck with a serious injury crisis and is staking a claim for a regular starting XI berth. He certainly looks to have a bright future ahead of him. I thought Dalot was having a decent game on the right, id have taken off rashford who’s had a shocker! Arsenal will look to reverse their 3-1 deficit against Rennes in the Europa League on Thursday, whilst United will face Wolves in the quarter finals of the FA Cup on Saturday.